My friends and I have been discussing Frozen lately. I’m frankly obsessed with it, as I’ve mentioned before, but I’m finding that many of my friends are equally entranced. The movie itself has generated a lot of talk about some of the messages it sends—in particular I appreciated the fact that Princess Anna didn’t need a Prince to save her—she ended up saving herself. I also appreciated the message behind the “Fixer-Upper” song—in how none of us is perfect, and more importantly, we aren’t going to change the person we love. Love itself, however, will temper how we view perceived failings. We’ve also discussed the ludicrous accusations of the Far Right that this movie somehow promotes the mythical Gay Agenda. Funny, I didn’t see that. I saw how the love that two sisters had for each other was more important than anything else in their lives—a testament to family. My guess is that the people crying ‘foul’ here are bothered by the real message: that a woman doesn’t need a man to be a whole person. There’s only one thing that scares the conservative Tea Party more than gays. That’s an independent, free-thinking woman. Why? Because collectively, we make up a very large minority. Big enough to take them down come next election time. This frightens them so much—which is why we are seeing more and more reactive legislature on their part: birth control and abortion restrictions, striking down laws for equal pay, killing programs that would benefit working mothers and help them get off welfare, etc. However, they can’t directly attack women without shooting their platform in the foot (again). Hence, the implantation of the idea that being an Independent Woman leads to becoming a Lesbian. That is a chain they can safely rattle, or so they believe. Keep your girls at home, don’t let them get an education. Isolate them from the world so they stay ‘pure’. Brainwash them into being the proper little women you want them to be. Frankly, one of the many reasons I am so pro-marriage equality is that I’ve never met a homophobe who wasn’t also extremely misogynistic. I also believe that we don’t fight and win our civil rights battles once—they are an ongoing battlefield that must be protected every day, or else someone will try to strip us of those hard-won rights. But that wasn’t what I started out to say here. What I really wanted to talk about was how the song “Let It Go” has taken hold in the hearts of so many people. Everywhere I go, I hear people singing it. Jimmy Fallon does a rendition with Idina Menzel and the Roots on the Tonight Show. Type in ‘Let it Go’ on Youtube and you’ll get dozens of covers, from an Africanized tribal cover to one in multiple languages to a completely (and stunning) instrumental version by The Piano Guys. Why? Why has this song taken the world by storm? I think it has a lot to do with the fact that is speaks to so many people on so many different levels. I think most of us have something we hide from the rest of the world, something that it is Real Us that we are afraid to share with the rest of the world because we’re afraid no one will like us, or that they will judge us. And truth be told, we fear with good reason. Most of us have been judged. Because we’re nerds who like Doctor Who and Star Trek beyond all reason, or because we are smarter than most of the people we know, or because we think we’re ugly, or we’re afraid to admit to our sexual preferences, or scared to follow our dreams. Because we’ve been taught to hide our real selves. We’re ashamed on some level of being who we are because who we are isn’t like everyone else and above all, we have to be like the crowd, right? Who we are is what makes us unique. It’s what makes us interesting. It is where our power originates. The look on Elsa’s face when she finally releases the magic within her is truly glorious. I can watch that sequence over and over again as she remakes herself into her own image, stripping herself of the trappings laid on her by society. 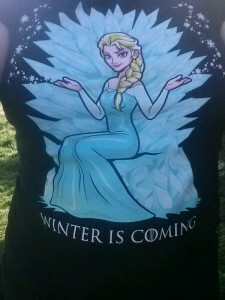 “The cold never bothered me anyway” has become my personal mantra. We all have something that we need to let go. Past hurts and resentments. Fears and failings. The idea that if only we’d done ‘x’ differently, our lives would somehow be magically better. We forget that every decision made brought us to this moment in time, in contact with the people we know and love now, positioned to take what is being offered to us if we’d only take off the gloves holding us back. If we’d only stop letting fear control our decisions and instead, we embrace the uniqueness that is us. This entry was posted in Uncategorized and tagged civil rights, Frozen, homophobia, life balance, marriage equality, misogyny, Sarah Madison, women's sexuality by Sarah Madison. Bookmark the permalink. The far right here don’t have the hold they do with the US. They’re still here, of course, but their political influence as Christian entities in laughably low. They have no power, can’t demand appeasement and grovelling from our politicians. Mostly, I think, because the UK is far more secular and we view extreme religious views, particularly in our politicians, some disdain. We just don’t trust that sort of extremism. The cool temperate zone that is the Church of England – that stereotype of quiet decorum and good taste – is much more the natural, national feeling towards religion. Gay marriage is legal here now and I couldn’t be prouder of my country on the day that went into law. Society didn’t fall down and crumble. Most people just went on their merry way, unregarding. And unafraid. And that’s what the right hate. They want us afraid. Without our fear, they have no power. So yeah. Let it go. And really, don’t let the cold bother you. Yes! THIS! Because that’s how universal it is. I think that’s why it appeals to so many, and why Frozen has become the highest grossing animated movie of all time. The thing I find interesting in the US is that this country was (in part) founded on the principles of religious freedom, freedom from persecution for your beliefs. The separation of Church and State is fundamental to our Constitution. Yet the people who wave the Constitution around and shout the loudest about our Founding Fathers frequently are the biggest abusers of civil rights. The Far Right in this country has become a platform for old wealthy men…and devout believers. Small wonder they are losing supporters in droves. They are becoming even more reactionary as this happens because anger is the best rallying cry for their aging base. You know, I have a hard time listening to anyone spout about the ‘sanctity of life’ when their desire to protect it and nurture it ends the SECOND that life enters the world. The funny thing is, I’m a Christian. I grew up in a Christian household and I have strong beliefs. I believe in God. I stopped believing in the Church, however, a long time ago. Due entirely to your enthusiasm for it, I watched the film and enjoyed it enormously – truth to tell, all the more so for the frothing rage it stirred up in the hearts of some! One of the things I most liked about it was the recognition that other types of love are just as important as romantic love. It wasn’t only that Anna didn’t need a man to save her – though that was a wonderful, wonderful thing to see – but that she didn’t need a romantic love at *all*. It may sound strange, coming from a romance writer, but I wanted to stand up and applaud at that.